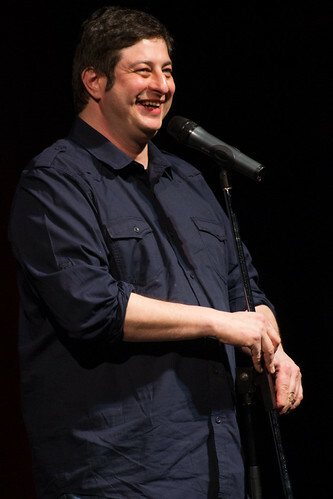 In a co-production that signaled both the closing weekend of the I Heart Jokes Festival and the opening weekend of the Toronto Sketch Comedy Festival, Eugene Mirman performed at Toronto’s Randolph Theatre Saturday night, his first show in the city since opening for Flight of the Conchords in 2009. Despite being a busy guy promoting his new album and voicing Gene on Bob’s Burgers, Mirman’s longtime habit of abusing corporate communication methods hasn’t suffered. He talked about his involvement in a Bonnaroo lineup announcement scheme, where he was supposed to reveal artists over the phone to fans. He instead started “a terrible but very funny rumour” that headliners would include “The Doors featuring Don Henley”. After recently becoming ordained to conduct marriage ceremonies in the US – and doing so twice for friends – he sought out a couple in the audience to “fake marry” on stage. The creative vows he wrote for the ceremony weren’t totally worth the journey, but seemed to be a thrill for the couple. More compelling were the awkward stories involving his growing (but still marginal) fame, including being recognized by a stripper mid-dance. She told him she frequently pleasured herself to the thought of interviewing him, an exchange made even more uncomfortable after Mirman first relayed it on stage and a New York blogger grossly misquoted it. His closer, about being possibly-mugged while walking in Mexico with REM frontman Michael Stipe, is a jaw-dropping tale that’s well on its way to becoming a classic. The story (which can also be heard on a recent episode of Sklarbro Country) is only eight weeks old, but even in its still-new state made for a great end to the evening. Show host Steph Tolev brought an energetic performance off the top, and Evan Desmarais and Rob Mailloux followed with solid sets of their own. But it was Chris Locke who immediately won over the crowd by wisely mocking the quantity of openers, and not allowing the size of the venue stop him from being playful with the audience. The Toronto Sketch Comedy Festival continues throughout the week, and I Heart Jokes presents standup shows year-round. Photos copyright Sharilyn Johnson. May not be reproduced without permission.